Mayor of Novi Sad, Mr. Miloš Vučević together with the Neobus Company representative Mr. Petar Matijević attended the signing of a long-term lease of the production facility of about 18,000 m² in the industrial zone of the City of Novi Sad. The contract was signed between the Neobus Company LLC., which operates within the Novi Sad-based Meat Industry Matijević LLC. and the US - based Company Delphi European Holdings Limited with its representative office Delphi Packard doo Novi Sad. The authorized representatives of the contracting parties on behalf of the Neobus Company were Mr. Mirko Kalkan, director, Mrs. Branka Grubor director of IM Matijević doo Novi Sad, as well as Mr. Željko Radanović, director of MPZ-Agrar doo Novi Sad, and on behalf of Delphi Packard doo Novi Sad, Mr. Zdenek Blazek from the Czech Republic and Mr. Vincent Fagard from Belgium. This is a great day for the City of Novi Sad and its citizens of Novi Sad and I am very proud that Novi Sad became the seat of such large international company such as Delphi. We are even more proud that there came to cooperation with the largest domestic Company such as Matijević, which is founded on sound, rational and economically justified basis. This venture, job creation of 3,000 vacancies in production, has not been seen in our City for decades. This also represents 3,000 new salaries in Novi Sad, which are taxed in the City budget, while in addition to the direct employment this will inevitably lead to additional employment and an increase in turnover and scope of provision of other services in the City. This is the way to boost the economy of the country, the region and the City, whereas we owe special gratitude to the Prime Minister, Mr. Aleksandar Vučić, for his most direct support to this project, as well as to the Matijević Company and representatives of the City Administration who have demonstrated patience and persistence during 14 months of negotiations with the US investor and who have led us to today’s conclusion of the contract – the Mayor said, adding that Mr. Fagard and his team have chosen the right place for development of their Company. - In wider context, the arrival of international companies positions the City in the international framework, while putting a clear message across, with a strong political connotation, that large corporations see Serbia as a stable region on long-term basis. The products that Delphi facility produces in Novi Sad will be oriented to export, which has a direct impact on the foreign trade deficit, and we will have new products made in Serbia. I hope that the citizens of Novi Sad and those from neighboring municipalities will take advantage of this opportunity and find employment in the economy sector – the Mayor said and welcomed Delphi Company to Novi Sad, while wishing them successful business operations. -The contract is stipulated between two completely privately-owned companies, US-based Delphi Company which has a turnover 17 billion dollars, and IM Matijević. 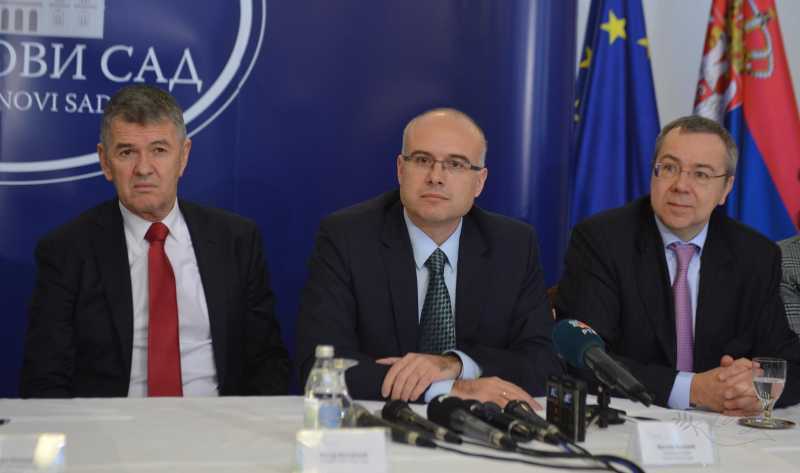 This investment is primarily important for Novi Sad since it will create jobs for about 3,000 people. My company employs 2,500 people and I know what it means to employ one worker and how much one job position costs. This is a great opportunity for all unemployed citizens of Novi Sad. Likewise, the arrival of this renowned Company is important, both for the city and for our country, because it signals that this is a good place to do business. When an American company comes into an area, it automatically means that there is security in investments. In addition, this is a signal for my Company that I should continue with investments, i.e., that I should direct my earnings to the purchase of new companies in the City and the country - Mr. Petar Matijević said. Mr. Vincent Fagard, who signed the contract on behalf of the Delphi Packard doo Novi Sad, thanked the City of Novi Sad and the Mayor, Mr. Miloš Vučević, for showing leadership and patience during negotiations with such a large corporation, adding special thanks to the Government of the Republic of Serbia for their support to this project. -It is a great pleasure and an honor to be here today and represent the Delphi Corporation. We are a company that produces parts for the automotive industry, supplying all major customers around the world and we are the leaders in the field of electronics for automobiles. 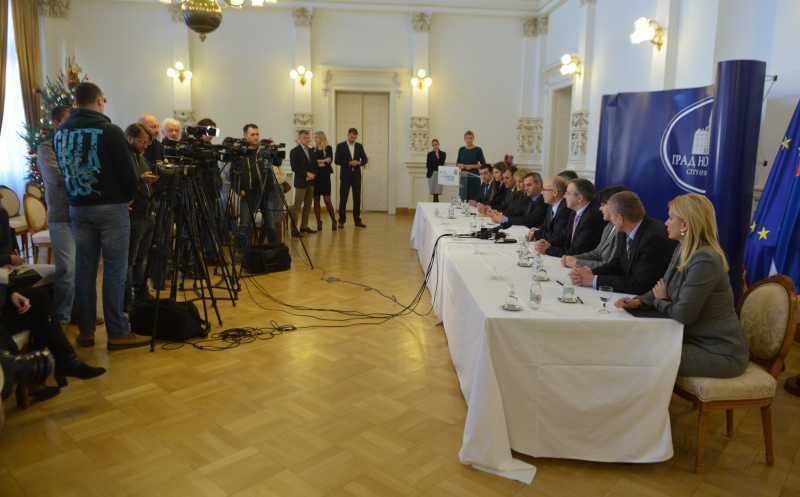 This is an important day in our corporate history, as the first step was made towards investing in Serbia. We, as the large multinational Company, have invested in a new country for the first time, so that the signing of this contract, from that point of view, represents a very important moment. We will have significant investments that will take place in phases over the next three years, which will lead to the creation of new jobs for about 3,000 people by 2018. By summer next year we will have 1,000 people who will be working in our production facility- Mr. Vincent Fagard said. Delphi European Holdings Limited Company is a leading global technology company for the market of cars and commercial vehicles, which provides solutions for safer driving by improving the quality of vehicles in traffic and protection of the environment from an ecological point of view. In rented premises in Novi Sad, Delphi intends to produce equipment to connect wires and cables necessary for the automotive industry, so they will need to recruit about 3,000 employees, which will be of paramount importance for domestic economy, as for the City of Novi Sad and Vojvodina, as well as for the Republic of Serbia in general.